[With Shuttle Service - Free Transfers Sydney City] This product is for travellers who are in Sydney City and require return transfers from the downtown Sydney City. 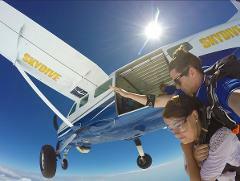 Skydive for travellers Staying in Sydney. Includes easy convenient return transfers from our Sydney City skydive checkin and departure lounge located at 196 Elizabeth St, Sydney. The closest skydive to Sydney only 55min from the city. Amazing views. 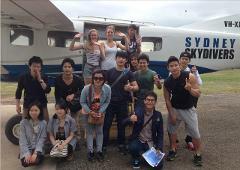 We offer the best service, value skydive and fun if you are looking to do a skydive in Sydney. Up to 14,000ft no more to pay. Sydney's only self contained full service skydiving centre, the closest to Sydney only 55min from the Sydney CBD. ** Please note due to Sydney traffic our 11am shuttle does not pickup from Kings Cross, only our 7am shuttle pickups up from Kings Cross.